Engineered to treat complex chronic conditions such as cancer, multiple sclerosis, rheumatoid arthritis, Parkinson’s disease, and hepatitis C, specialty prescription drugs represent less than 1% of all U.S. prescriptions yet are growing at an unsustainable rate—and employers are beginning to see their impact on healthcare costs. The Centers for Medicare and Medicaid Services estimates that prescription drug spending was 9.4% of all healthcare spending in 2012, and a large portion of that spending was on specialty drugs. In their 2013 Specialty Drug Trend Insights report, independent pharmacy benefit manager (PBM) Prime Therapeutics places that figure at 30% of total drug costs and predicts it will reach 50% by 2018. 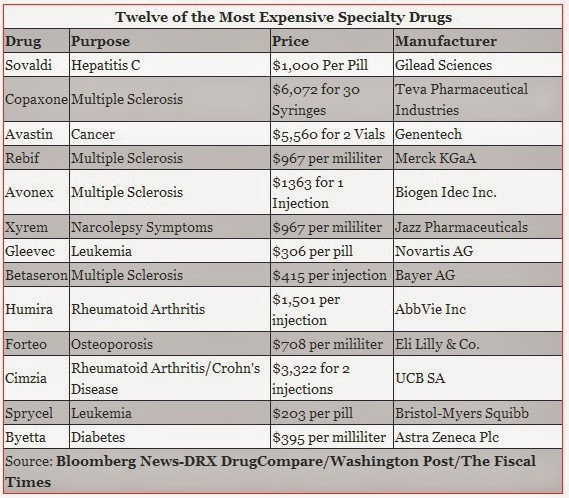 Express Scripts’ 2013 Drug Trend Report reveals that for the top traditional therapy classes, spending will likely climb 2% year-over-year for the next three years, whereas spending on specialty medications will increase 16.8% in 2014, 18.0% in 2015, and 18.2% by 2016. In their article, Employers Act to Control Prescription Drug Spending, the Society for Human Resource Management (SHRM) cites a 2013 survey by Buck Consultants finding that 71% of U.S. employers spent 16% or more of their total healthcare budget on pharmacy benefits. It can be challenging for employers to estimate their spending on specialty drugs because these drugs are sometimes billed through medical benefits—and other times billed through prescription drug benefits. The inconsistency makes it difficult to get an accurate picture of how much is being spent on specialty medications. When employers move the administration of specialty drugs from the medical plan to the pharmacy program, they can take advantage of better care coordination that’s easier to measure. For example, instead of a doctor ordering and dispensing a specialty drug in their office and billing it as a medical benefit, a prescription drug program can manage the drug’s cost and patient’s care. These tightly coordinated activities can lead to lower costs and easier reporting. Employers may require a prior authorization from a provider before a pharmacy can fill a specialty drug prescription. This added level of control helps making certain that patients are using the most cost-efficient and appropriate therapies. Many employers are adding a specialty drug tier to pass along at least some of the cost of more expensive drugs to employees and to help track the classes of drugs they’re utilizing. When benefits are tiered, different categories of drugs require different out-of-pocket costs, and categories may be broken up into preferred drugs and non-preferred drugs, generics, and specialty, depending on the needs of the plan sponsor or economics of the formulary. Additionally, plans may include refill policies or step-therapy protocols. Refill policies use clinical evidence to limit doses, ensuring a patient tolerates a new drug or to avoid wasting expensive medicine; step therapy requires patients to start treatment with a lower-cost alternative drug, if available, and transition to a specialty drug if the medication at the first step isn’t effective. Many employer groups and health plans rely on pharmacy experts to help them manage their prescription drug benefit design, administration, and clinical needs, resulting in greater cost control. These companies can provide employers with the best “buys” for certain high-cost drugs thanks to their ability to leverage costs across networks and providers while providing a wide range of value-added services that can make a big impact on a company’s overall healthcare benefits costs. More and more employers consider their employees’ care coordination a key element in containing costs, improving quality, and creating better outcomes, especially for those being treated for chronic illnesses. Utilization management performed by medical professionals effectively intertwines a patient with their healthcare benefits to ensure they are maximizing their coverage and receiving medically necessary care. By following an individual’s progress, coordinating their care, and ensuring that treatments such as prescribed drugs are appropriate, a case manager can play an important role in assuring treatment compliance, minimizing health risks, and reducing waste in healthcare spending.